I’d prepared a large batch of rempah which could be used for a wide variety of dishes which calls for it. The cooked rempah is then divided and packed into individual bags to be and chilled or frozen for future dishes. 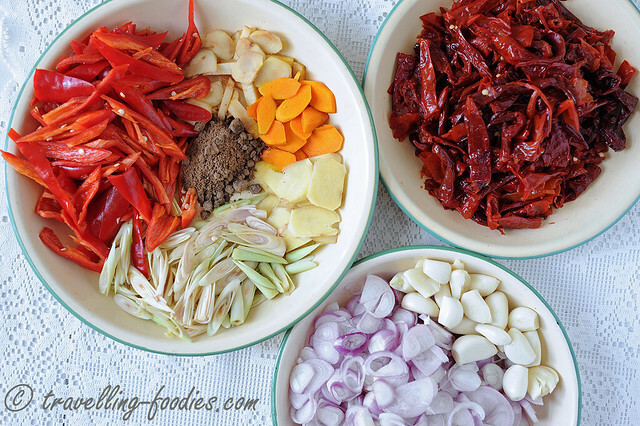 Given some additional ingredients and modification, it could be used as the base for laksa nyonya, curry chicken and even rendang! Yes, some would be wondering if belacan is found in rendang and indeed it is not in traditional recipes. It is noticeable but I don’t think its inclusion alters the flavours of the rendang dramatically. Just need to watch the salt as belacan is already quite savory as it is. But for those purists at heart, simply omit it entirely. 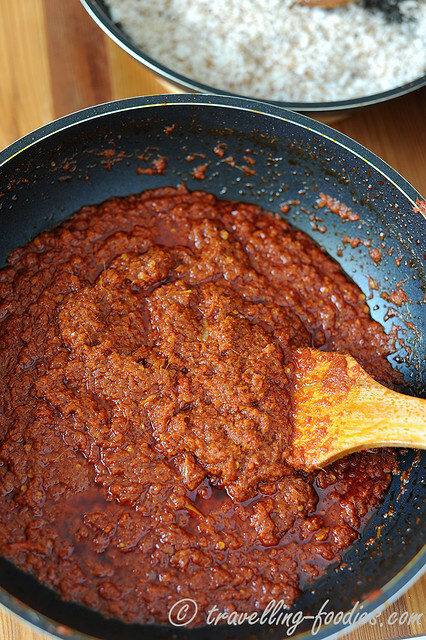 The process for making rendang is pretty much the same for any dish which requires a rempah. Also known as bumbu in Bahasa Indonesia, the most tedious part is actually the prep work that leads to the blending or pounding of the rempah. 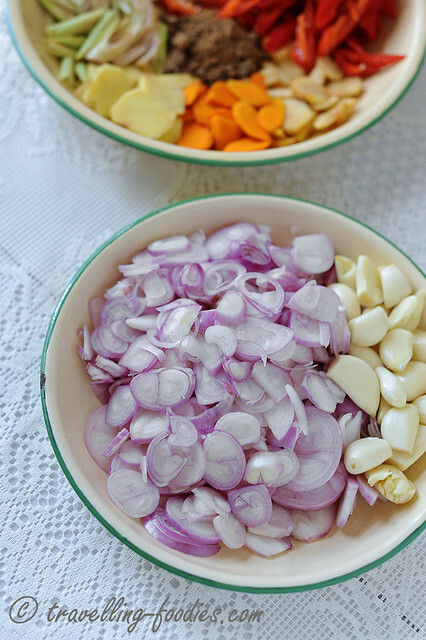 All that peeling, slicing and chopping takes up the bulk of the time in fact! But this is necessary to ensure a good rempah. Getting the rempah cooked the correct way is simply a game of patience. Firstly, one shouldn’t fear using too much oil. Half a cup of oil may seem a lot but trust me, I’d seen ladies who are even more liberal with the amount of oil they used. Fear not, as the oil is entirely necessary to ensure several things. First and foremost, it ensures that the rempah cooks evenly. The very fact that the flashpoint of oil is much higher than the boiling point of water means that the rempah would cook faster, even under very controlled low heat settings. The oil gets the ingredients “sauteed” and not “braised” and the ingredients’ own juices within. The two taste totally different. It is also easier to observe the rempah “pecah minyak“, which is the point where the rempah is sufficiently cooked, allowing the oil to separate and float about the other ingredients, forming two distinct layers. That is when one knows that the rempah is almost ready, as it darkens considerably and begins to glisten. During storage, the oil also acts as a barrier to prevent the rempah from being oxidised or drying out. 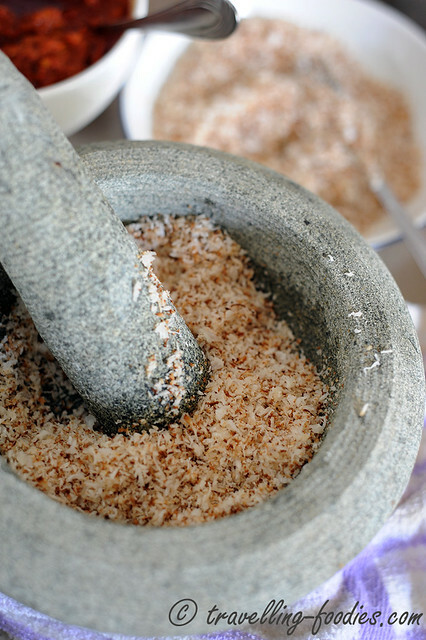 While the rempah is cooking under low heat, kerisik is prepared by dry frying freshly grated coconut under medium low heat. Kerisik is an absolute must in all rendangs as it lends a distinct earthy tone as well as the characteristic nutty aroma, imparted through the toasting. It takes quite a bit of juggling work if the coconut is toasted at the same time the rempah is being cooked. As such, kerisik could be made way in advance as it could be stored in the freezer for months at ends. 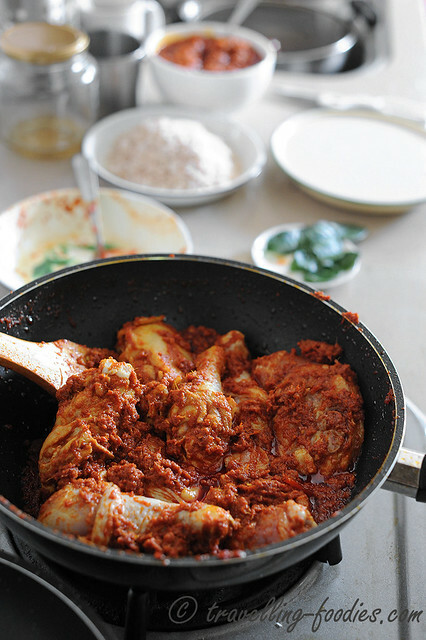 The chicken chunks are first pan fried lightly in the rempah paste until the skin begins to brown slightly. 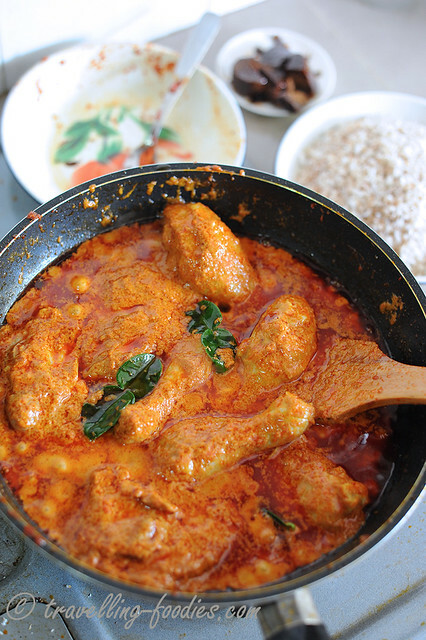 Thick coconut milk is then added, and together with it the crushed kaffir lime leaves. Crushing or ripping the leaves help to release the aroma from the leaves. Everything is stirred thoroughly before being allowed to simmer, without the lid so as to allow the sauce to darken as well as thicken. Gula Melaka is also added at this point. While everything is stewing away, the kerisik could be pounded to help it release some of the oils within as well as to intensify the nutty aroma. 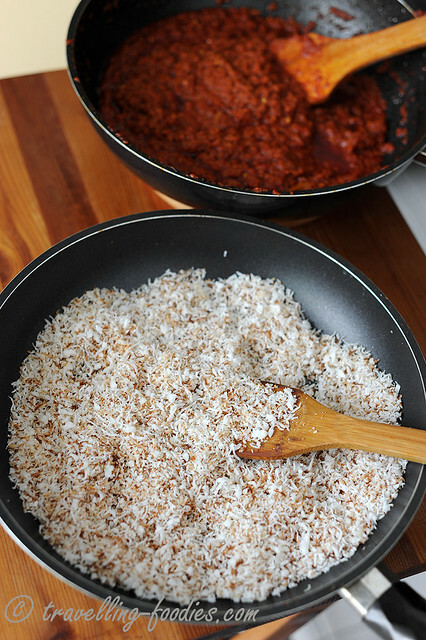 Blend or pound all the Generic Rempah ingredients into a coarse paste. Add cooking oil to a heated wok over medium low heat and saute the rempah ingredients until fragrant and “pecah minyak“, i.e. when the rempah darkens considerably, starts to glisten as the oil begins to separate from the paste.Scoop up half of the rempah and leave to cool to bag and freeze for future use. Add thick coconut milk, crushed kaffir lime leaves and gula melaka. As mentioned earlier, I’d added belacan into the generic rempah but that is entirely optional as traditional rendang recipes do not call for it. However, its inclusion doesn’t alter the flavours dramatically, though it is still noticeable. For the die-heart purists, omit the belacan entirely! How “pekat” (concentrated and dried) the final product ought to be is entirely up to the individual. I didn’t dry it up entirely so as to allow some gravy to remain which goes very very well with steamed rice. Sugar is added because chicken does not impart a natural sweetness to the gravy as red meats like beef and mutton does. I prefer gula melaka whenever possible as it enriches the flavours of the gravy considerably. Otherwise, regular sugar works too. 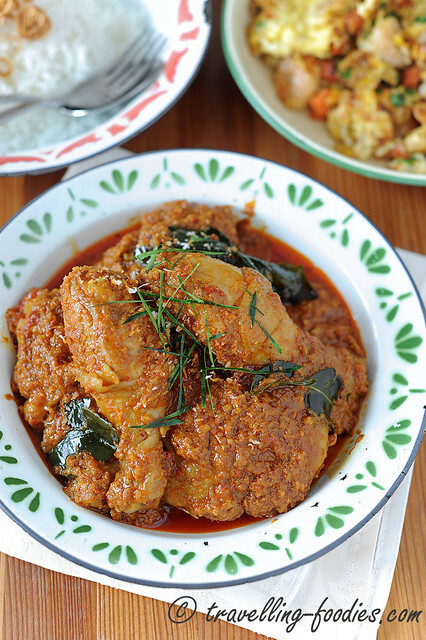 Traditional recipes for rendang calls for daun kunyit (tumeric leaves) . We prefer to add kaffir lime leaves instead. It has been a practice at home for years as we have a kaffir lime plant at home. Do not feel obliged to use kaffir lime leaves like us but those who tried never looked back. The recipe is pretty much the same with rendang daging (beef rendang), just that less gula melaka is used or is omitted entirely. Otherwise, the recipe remains pretty much the same. This entry was posted on June 17, 2014 by Alan (travellingfoodies). It was filed under Food, Simple Eats and was tagged with chicken, kerisik, malay, Nonya, Nyonya, Peranakan, rempah, Rendang Ayam, straits chinese. If i wish to cook one whole chicken, should i double up the ingredients (grated coconut, coconut milk, etc)? Do u have email address? Can i email u? Coz i have some question to ask u. Is abt the kueh lapis sagu. I used to buy jumbo chicken to cook curry chicken. The jumbo chicken is about 1.5kg. So I just use the recipe as it is? I won’t advise on using storebought cili boh as benzoic acid is commonly added as a preservative. Apart from the chemical effects they have, the usage of cili boh would cause the sauce to have a sourish edge which would be kinda weird in a rendang. May I check whether you use a blender (need to add water) or mixer (cannot add water) to blend the rempah? 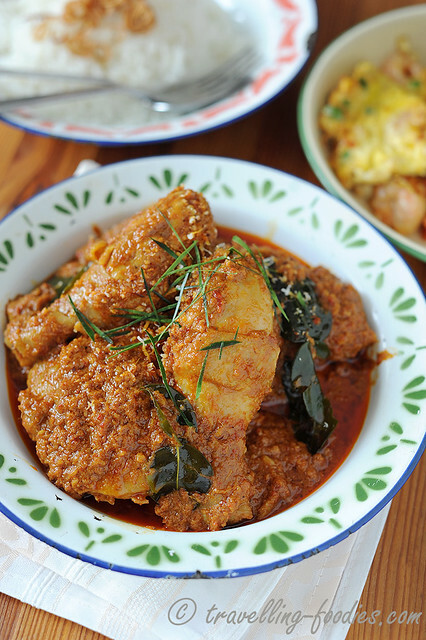 Great info the variant of Rendang in Malaysia. Would like to know more of Peranakan Chinese Food heritage. There are many different types of rendang, some like it simple, some prefer a more complicated recipe to deem it authentic. It all boils down to ones cultural bearings. To make sweeping remarks as to denounce a recipe doesn’t seem like something which someone who “tahu adat” would do. Then again, it all boils down to one’s upbringing.